Hey there friends & Happy New Year! We hope everyone enjoyed their holidays. We sure did and are so excited to embark on another incredible year of meeting and getting to photograph all of your beautiful furbabies!! 🙂 And we want to say a huge THANK YOU to all of our amazing clients from this past year… you certainly made our year an unforgettable dream come true! 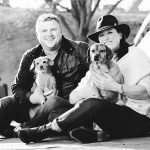 Today, we want to share with you the beautiful love story of a very special pup named Freddie and his humans who are getting married this year!! Freddie’s mom and dad scheduled us for one of our super fun pawfect save-the-date sessions so they could feature their sweet Freddie in their wedding announcement. What an awesome idea, right?!! Well, let me tell you, this shoot was not only OODLES of fun, it was also incredibly sweet and moving. It’s almost as though Freddie knew exactly what he was there to announce and he was proud to be part of his mom and dad’s special day! The session took place in one of our beautiful City neighborhoods on an unseasonably warm winter day. It was the perfect backdrop to showcase this love story. Here’s a little bit about our featured cutie-patootie! Freddie is a 4-year old Pekingese Poodle mix (Pekepoo) who will do anything for a yummy treat and a belly rub. This was quite handy during the shoot, because we got some super adorable shots of Freddie chewing on a treat (proof below). While Freddie lives a pretty lavish lifestyle, his mom and dad think it’s a fair exchange! Freddie is one of the most affectionate dogs you’ll ever meet and he cuddled up to us too, which made us SO HAPPY!! In his spare time, Freddie enjoys going to visit his grandma, watching football and barking at other dogs four times his size. 🙂 But, Freddie’s life hasn’t always been this carefree. Freddie was rescued from a shelter after he spent a month on the streets in pretty bad condition. Thankfully, an amazing person rescued him off the streets and recognized that Freddie still had a spark of life left in him and got him to safety before it was too late. That’s when Freddie finally found his perfect furever home. So THANK YOU good samaritan for saving sweet Freddie & giving him a second chance at life… a now AMAZING life with his two incredible and loving humans! We are beyond honored to have met this special boy, and so thrilled that we got to photograph Freddie’s humans’ save-the-date! We wish them all the very best, a beautiful wedding day and an incredible life ahead! Here are some our favorite images from this unforgettable session. Enjoy. 🙂 *PS: We are saving the reveal of the actual save-the-date photo chosen by Freddie’s family so that we don’t ruin the surprise for everyone!